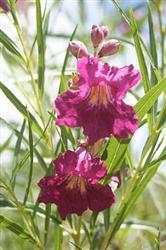 This selection of Desert Willow has gorgeous pink to deep red flowers that bloom in the spring and summer. It is tolerant of most soils but does well in sandy soils. It's parent is found naturally in sandy washes and dry stream-beds in desert areas where it exists on seasonal downpours and endures the long drought by accessing sub-surface water. The flowers are fragrant and attractive to hummingbirds. Desert willows are winter deciduous and are excellent for small spaces. You can expect a height between 5' and 20' with a similar width.